Nearly nineteen years ago to the day, Natalie Rhodes felt what it was like to lose in the championship game of the WIAA State Volleyball Tournament. 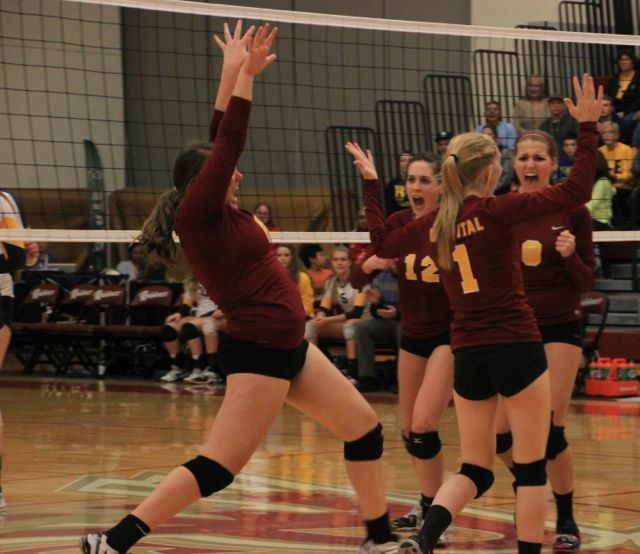 On Saturday night, the feeling came back as the head coach of the Capital High School volleyball team saw the Cougars fall to Burlington Edison 3-0 in the 2A State Championship game at Pierce College Fort Steilacom, ending an otherwise successful season for CHS. Capital earned an appearance in the title game after defeating Sehome 3-1 in the 2A State semi-finals Saturday afternoon. Rhodes was a standout player for the Cougars in the 1994 3A State Tournament, in which Capital fell to Selah in the title match. Saturday evening didn’t serve as redemption for the Cougars and Rhodes (who, according to a Seattle Times Article from Nov. 1994, had 12 kills in the title match against Selah) but the longtime head coach of the Cougars was proud of her team for their determination, something she believes was key for their success this season. Capital was unable to consistently penetrate the Burlington Edison defense, a huge credit to the defensive ability of the Tigers back-line. The Cougars appeared to have a great opportunity to take the second set of the match following the Tigers 25-18 victory in game one. However, a late run in set two by the Tigers propelled BEHS to a 25-23 triumph, which parlayed into a 25-17 victory in game three to complete the sweep. The determination Rhodes mentioned helped the Cougars fight back from 4-1 defecit to even the score at 15-15 before the Tigers went on another sustained run. Despite the loss, Capital has several positives to take-away from the match. The majority of their roster will return next season. They also have enjoyed incredible support from the Capital fans, which filled the gym in numbers with their loud cheering. Evergreen League MVP Rachel Erickson returns, as does fellow juniors Marissa Ottesen and Samantha Yorke, both of which earned all-league honors. Capital won the Evergreen League Title and the District IV 2A Championship en route to their second championship game in school history. “We have the best fans, they filled up 3/4ths of the stands and it was so loud during pregame. I know our girls were really pumped up by that and to see the fans so excited for us is something hard to describe,” said Rhodes. For Rhodes, as she stood on the court surrounded by her team, friends, and CHS supporters, the memories from 1994 still stood fresh in her mind.